The combination of chocolate and raspberry is part of a romantic tradition in our house. About 2 months after we met, Brian took me out for a romantic birthday dinner at an elegant French restaurant and I was particularly looking forward to a chocolate dessert. Wouldn't you know, they didn't have one! So the following week, when he came over, he brought a gorgeous chocolate cake from a bakery near him. It was several layers of rich chocolate cake with chocolate buttercream between the layers, a chocolate ganache coating and a tall heap of chocolate curls and shavings dusted with powdered sugar over the top. Wow. When we cut into it we realized that the layers of cake also had a raspberry coating and it created the most amazing contrasting flavor to the overwhelmingly rich chocolate. The cake came from a bakery called Audrey's Fine Cakes (out on Long Island) and we've had it several times since then. We try to avoid it because the cake is large and, if we keep eating it, we'll grow large. But when we do indulge, we need only look at each other and say "Audrey's." It's our special cake. 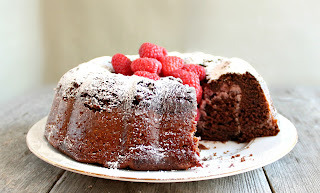 I've never tried to recreate it before but, when the founders of the Bundt-a-Month group, Anuradha of Baker Street and Lora of Cake Duchess, selected chocolate as the February flavor, I realized it was my perfect opportunity to try. Because the same technique that works on a layer cake would make the inside of a bundt soggy, I modified the raspberry into a cream cheese swirl. The result was even better than I'd hoped and we practically inhaled the whole cake over a weekend. Enjoy! Make the raspberry swirl by beating together the cream cheese, sugar, egg and jam until all the ingredients are fully incorporated. The mixture will be loose so keep it in the refrigerator while you prep the cake batter. 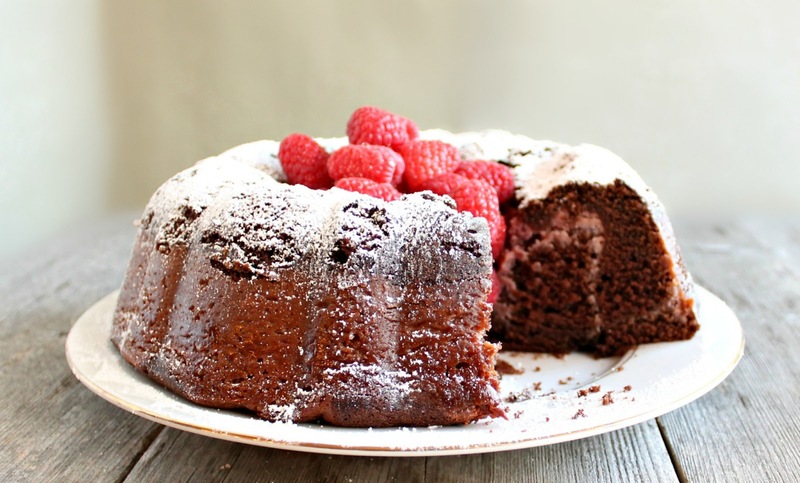 To make the cake, combine the flour, baking powder, baking soda, cocoa powder and salt in a bowl. In a separate bowl, beat together the sugar, butter, eggs, water and vanilla. Slowly beat the dry ingredients into the wet mixture until everything is fully incorporated. Butter and flour a 12 cup bundt pan and pour in half the chocolate batter. Pour the raspberry mixture over that and top with the remaining chocolate batter. Bake in a thoroughly pre-heated 350 degree oven for 1 hour. Note that a toothpick may come out clean after 55 minutes but the cake has so much moisture from the jam that it needs the extra five minutes in the oven. Cool completely (allow a couple of hours) before turning out of the pan. Makes 10 - 12 servings. Woah! That sounds insanely delicious! I love the idea of switching it to a cream cheese swirl. Rich, luscious and oh so decadent! Thanks for baking along and sharing this wonderful recipe, Anita! This looks amazing, Anita. My favorite flavor combo is chocolate/raspberry so I know I'll be giving this a try. This is so gorgeous! I want that swirl! Wow. This month is a great theme! All these cakes look great and I love that raspberry swirl in yours. Love the story and my first thought when I read, "he brought a gorgeous chocolate cake from a bakery near him," was "Yep, a keeper!" Awww I love your guys' little tradition! The cake sounds/looks amazing! What a sweet story of how chocolate and raspberries hold such great memories for you both. What a great cake to celebrate those memories too. A great cake to remember such a nice story. That raspberry cream cheese sounds really good, it´s goes so well with dark chocolate. Wonderful bundt! What a lovely story behind this cake-- perfect for Valentine's this month. Your cake is beautiful! You and these swirl layers are driving me crazy! 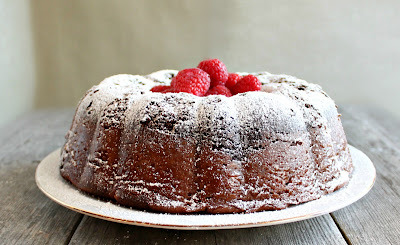 I am going to just have to break down and bake one of these beautiful bundts! 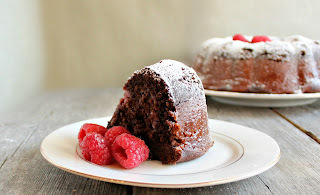 Love the backstory to your Chocolate Raspberry Swirl Bundt. Appreciate too your tips to make the swirl and refrigerate before making the batter. This is one of my favorite flavor combos. Becoming large would be a risk with this beauty as well. A raspberry cream cheese swirl??? Ooh, la la...how magnificent, Anita! YUM! Love that idea of the raspberry cream cheese swirl! How insanely delicious this sounds! I'd have a hard time stopping at one slice too! I love chocolate and raspberry together. Lovely combo! I loved hearing the story about your special cake, which by the way sounds insanely good! That's so cool when a couple has those little things, special to only them. This bundt sounds fantastic too. I love the raspberry cream cheese swirl! 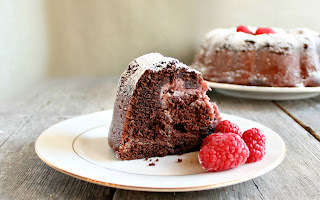 Chocolate and raspberry are two of my ultimate flavors and together they are divine!! Lovely cake!! This cake is gorgeous! I love the raspberry and chocolate combination! This looks delicious! I love the chocolate raspberry combination. Thanks for sharing on Foodie Friends Friday. Please stop back by today to vote. I totally agree! Chocolate and raspberry are just romantic together. I love that combination, perfect for V-day. Your cake is so gorgeous and elegant. I love it. I made this for my anniversary today...it's cooling and smells great! The cocoa powder, however, was not listed in the instructions--I just added it to the dry ingredients once I realized it was absent. I'll update once we try it tonight! Hi, there! You are absolutely correct and I have updated the recipe. Sorry about that and thank you so much for pointing it out to me! I hope you enjoy the cake and happy anniversary! Thanks for your reply (and fixing the error)! The cake was DELICIOUS. A true winner. We subbed out raspberry for boysenberry jam and it was so good! Also used room temp butter. Thanks again for the great recipe!